Shortly after the United States-Mexico-Canada Agreement was signed Nov. 30, President Trump threatened to formally terminate the North American Free Trade Agreement. 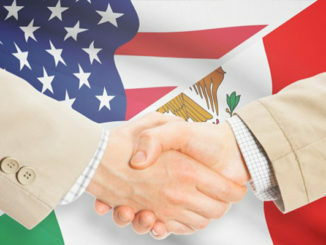 Such action, the timing of which is uncertain but could be almost immediate, would give members of Congress on both sides of the aisle a stark choice: Promptly approve USMCA or face North American trade subject only to World Trade Organization tariffs without governing rules on customs, investment and other obligations set out in NAFTA and in more modern form in USMCA. Congress should act responsibly and quickly approve USMCA, and the president should defer formal termination of NAFTA. While some members of Congress have criticized USMCA for the weakness of its labor and environmental provisions (Democrats) and for lack of robust protections for foreign investors and burdensome rules of origin for automobiles (Republicans), few have suggested that the region would be better off without either the USMCA or NAFTA. The danger of losing duty-free trade benefits that exist under both treaties is particularly great for Texas, where total goods and services trade with Mexico reached $187 billion in 2017 — more than for any other state. Should the president move forward with denunciation of NAFTA, he would be playing hardball with Congress and the business community. But the ploy would be beneficial to the United States and to Texas if it convinces Congress to approve USMCA promptly. Hopefully, the Texas congressional delegation will lead the approval efforts. Under the Trade Promotion Authority granted to the president, several legally required procedural steps must be completed before the administration can ask Congress for USMCA approval. These include transmission of the final signed text and draft implementing legislation to Congress and the completion of a study of the probable economic effects of USMCA on the United States by the U.S. International Trade Commission. These steps are subject to various timetables but are not likely to be completed until mid-March. Once the agreement is sent to Congress, it has 90 “session” days to either approve or reject it; no changes may be made. Typically, a president does not send a trade agreement to Congress unless he is reasonably sure he has the necessary majority in both the House and Senate. Under NAFTA, any party “may withdraw six months after it provides a written notice.” Should the president give formal notice of U.S. intent to withdraw, termination would probably not be automatic. Rather, the president would need to take further action, presumably by notice to Canada and Mexico, to make it effective. Thus, at any time after six months, the president could choose what he believed to be the most opportune moment to put maximum pressure on Congress and withdraw. Alternatively, the president could wait to trigger the six-month notice period until the administration is prepared to send USMCA to Congress. But what would happen if Congress calls Trump’s bluff and refuses to pass the USMCA? It is unclear whether a president has authority under the Constitution to terminate NAFTA without congressional assent, and whether the action would also result in the immediate increase in tariffs on inter-North American Trade from zero under NAFTA to WTO tariff levels. 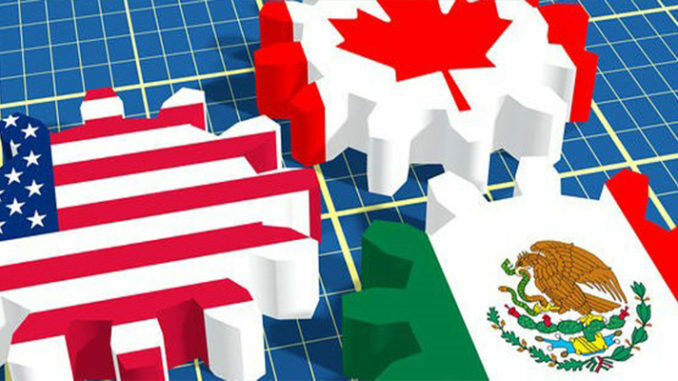 With WTO tariffs on the average between 3.5 and 4.5 percent for the United States and Canada and around 7 percent for Mexico. Rates on certain specific goods are much higher. 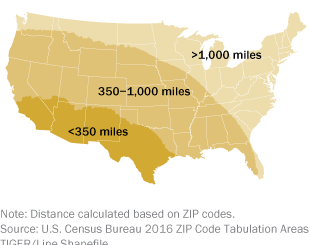 For example, Mexico’s non-preferential WTO tariffs on imports of corn and pork are 20 percent, compared to 0 percent under NAFTA and USMCA.” An increase in tariffs would have an immediate and deleterious effect on regional trade and regional supply chains, both in Texas and elsewhere. Should action by the president to withdraw from NAFTA be finalized, it could trigger a severe adverse congressional reaction, litigation and even a constitutional crisis Under the best of circumstances such action would create massive uncertainty among enterprises trading within North America and seriously jeopardize investment and employment. The crisis would also be welcomed by America’s economic adversaries worldwide, particularly China. Luckily, Trump possesses a powerful but high-risk tool to encourage Congress to promptly approve the USMCA. He could always credibly threaten to terminate NAFTA by giving formal notice, yet refrain from pulling the trigger on actual withdrawal and maintain control over the precise timing of any final action. This would help ensure that his crowning achievement in the trade field will not die in Congress or be delayed indefinitely. Whether or not one approves of the brinkmanship this approach represents, it may be the best way to push through a much-needed modernization of NAFTA. David A. Gantz is the Will Clayton Fellow in Trade and International Economics at Rice University’s Baker Institute for Public Policy.